Cold weather means it is time to load up on warm and filling comfort foods like soups and stews. This Easy Beef Vegetable Noodle Soup fits all your winter dining needs- rich, hearty, filling, belly warming and flavorful. Not to mention how simple it is to throw together. We are all about making recipes super easy to assemble and quick so they are convenient for feeding our families. 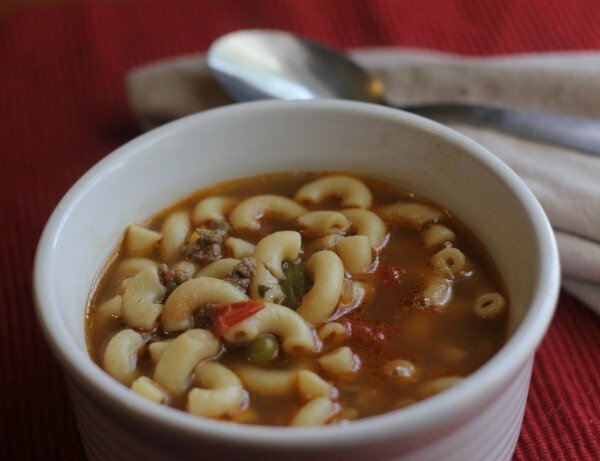 Ground beef and a sturdy noodle make the base for this delicious soup, creating a dish that is an entire meal in itself. It also cooks up quickly, in just 20 minutes, for those nights when you are short on time but need a hot and filling meal. Customize your soup using your favorite pasta and vegetables, fresh or frozen. To create a recipe that is more waistline friendly or to follow Weight Watchers you can use whole wheat pasta, lean beef or even ground turkey, and reduced sodium broth. Serve with crackers or a delicious crusty bread meant for dipping. Trust me when I tell you the leftovers are as good if not better so you will want to make the full batch! Brown ground beef and garlic in a large 4-quart pan, drain excess oil. Add vegetables, noodles, diced tomatoes, broth, water, garlic, Italian seasoning, and black pepper. While I am not directly affiliated with Weight Watchers, I am a current member. I calculated this recipe twice in the Recipe Builder within the program using whole wheat pasta and ground turkey. The SmartPoints are the same when using the leanest meat options. You can also use the Weight Watchers SmartPoints Calculator if you want to verify on your own. Note: Not all pasta is created equally. I use the Essential Every Day Whole Wheat brand for this recipe. Verify your pasta calculations before making this as it can change. Print this recipe an add to your weekly menu plan this week. Not only is it super easy to make, it is seriously budget friendly. We are all about keeping in budget while giving your family great food they will love. This hearty soup is going to make everyone happy tonight. Don’t forget it makes a great freezer meal that is simple to heat back up in your Crockpot on a busy day! If you want to make and freeze, prepare all but the noodles and add them when ready to reheat-simmer the same 20 minutes to cook noodles. I like making large batches of this on Sunday to portion into my Tupperware Vent ‘N Serve® Bowls for fast lunches throughout the week. The medium set is ideal for a lunch portion that fits into my daily points. Plus it is super satisfying to make this Beef Vegetable Noodle Soup as a decent lunch with low points. Sounds so deliciously simple – Thanks for sharing at the What’s for Dinner Party! mmmm, I love noodles in soup. And this recipe looks so easy! Delicious! I can live on soups.. Thank you for sharing with FF. 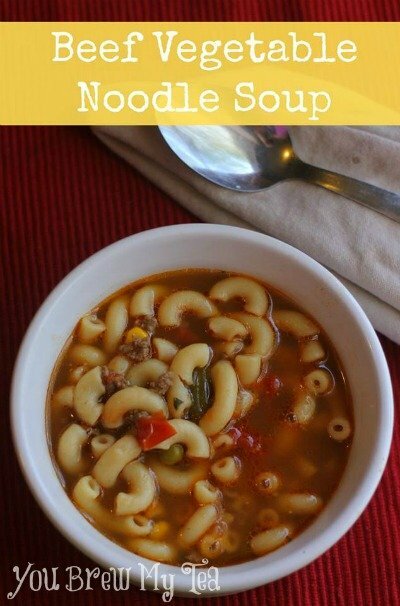 We love a Beef Vegetable and Noodle Soup, this looks delicious! Your post is awesome and thanks so much for sharing it with us at Full Plate Thursday. Hope you have a great week and come back to see us real soon!